French dramatist and writer Alfred Jarry (1873-1907) is best known for his radical play Ubu Roi, which singlehandedly managed to change the entire face of theater in the late 19th century. But Jarry’s real art was his life — his penchant for carrying, and using, pistols in the streets and cafes of Paris; his massive consumption of absinthe and ether; his picturesque manner of speech (he habitually employed the royal “we” in ordinary conversation); his peculiar habitations (one, which he called “Our Grand Chasublerie,” was a tiny apartment above a store that sold priests’ garments, another was on the second-and-a-half floor of an old building, and a third, which he dubbed “The Tripod,” was a hut which stood on two wobbly legs above the muddy Seine). Lying on his deathbed at age 34, Jarry’s last request was for a toothpick. Coupled with his fascinating literary output, these exploits made Jarry legendary among other writers and artists in his own era, and long beyond. 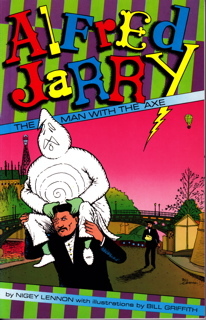 Alfred Jarry: The Man with the Axe is the first non-academic English-language biography of Jarry, a fond and humorous, yet metiulously researched look at its subject. A close collaboration between author Nigey Lennon — two of whose other books were about Mark Twain and Frank Zappa — and underground comix legend Bill Griffith (creator of the long-running Zippy the Pinhead strip), The Man with the Axe brings alive its eccentric, colorful subject in multiple dimensions, introducing him to a whole new generation of readers.